If instead true we will have a false, it means so much, that in our nested ESXi will be able to run 32-bit systems only. The operating system we choose, as shown below. 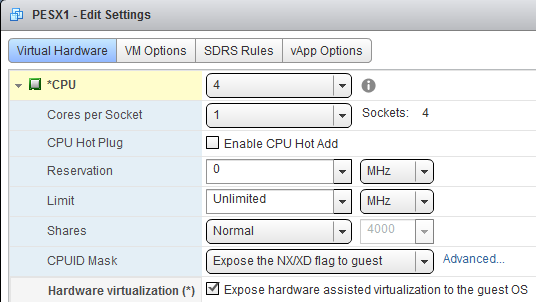 Installing VMware Tools inside ESXi is a very important step in the vSphere environment, so crafted host is fully managed and monitored by vCenter. If our installation takes place inside VMware Workstation, driver installation is not required, but helpful. Very important information. In case you convert ESXi to template and generate several servers, you have a problem. All ESXi will have the same UUID (you can check by the command: “esxcli system uuid get”). To prevent this, we have to run the template and remove the last line on /etc/vmware/esx.conf (/system/uuid =). In addition, use the command “esxcli system settings advanced set -o / Net / s FollowHardwareMac 1”, this will prevent duplicate MAC addresses on the VMkernel. If you do not execute the above. 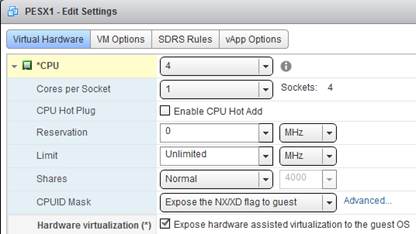 steps, and we will test the vSAN a message is displayed: Host can not communicate with all other nodes in the vSAN. After doing the above steps shutdown template. Each new server gets a new UUID.